Thai Cuisine is world famous and on the top of the lists of foodies for a good reason. We loved living in the beautiful Thai capital and we’re happy to show the best places to try Thai dishes in Bangkok. 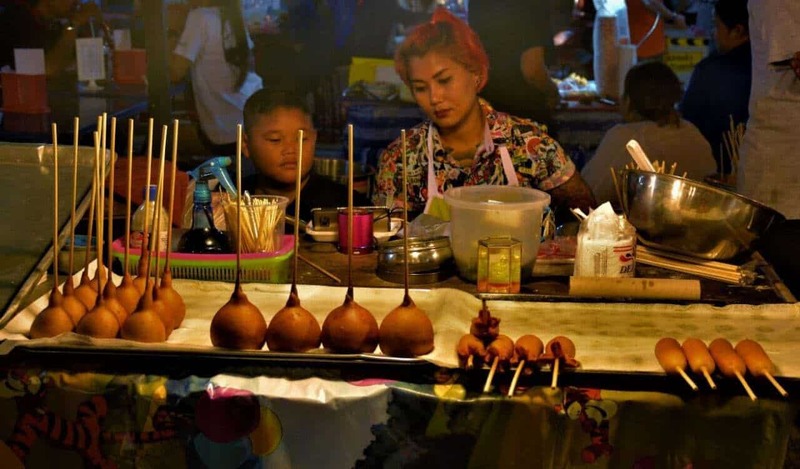 Bangkok is probably most famous for its street food. In 2017 Thai government announced that they will ban all street for in favor of clean, organized streets in the city. Making millions of foodies and travelers loudly protest against it as one. Thankfully, later on, the government said it was all a misunderstanding and they simply meant they only plan to regulate the vendors to make sure they do adhere to a certain hygienic standard. 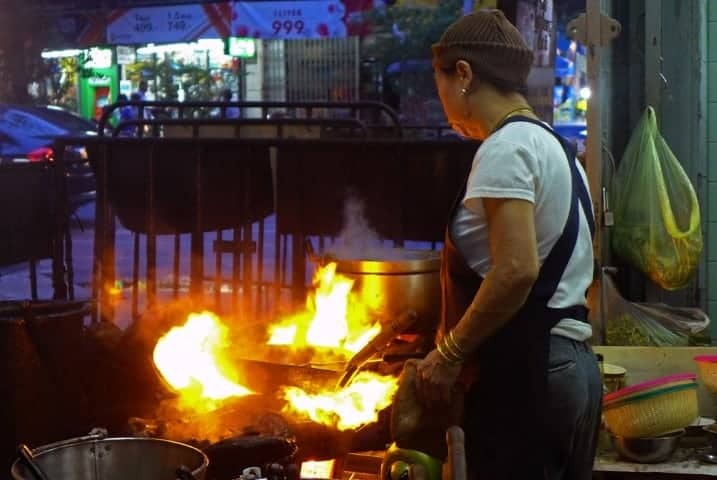 For now, It looks like Bangkok street food stays where it belongs; on the streets of Bangkok. We had a blast living in Bangkok and other parts of Thailand as well. And although we had wonderful feasts all over the country the most memorable ones definitely happened in Bangkok. Not just the street food, though. Unique and traditional restaurants both can easily be found if you know where to look for them. Not to mention we had the luck to be introduced to this city by our friend Ray, who is a born and raised Bangkokian. Here we collected all the great places we got to try from the well-known ones to the little local eateries. I also included many of the traditional places but also new cafe houses and restaurants. Becuase that’s what Bangkok is all about. 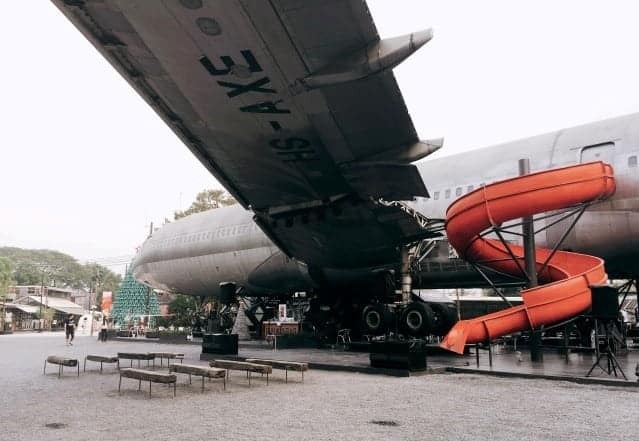 Here you can embrace and get lost in the past in vintage cafe houses and restaurants but also see the newest and quirkiest of places and discover Bangkok’s creative side to see what the future holds for this fascinating city. 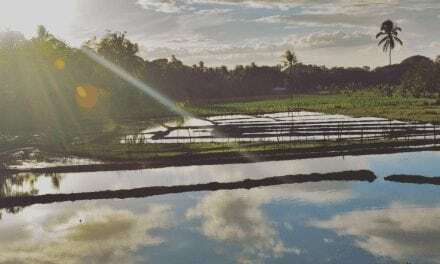 To truly understand Thai culture you should experience both because we believe that one of the best ways to understand and to get to know a culture is through our tummy! Let’s do this! We were blown away by the endless options for eating from street food to fine dining. As being one of the most visited destinations, Bangkok hosts restaurants with cuisine from all around the world. Khao San Road and Yaowarat Road, Bangkok’s China Town is the two favorite of all travelers and locals to indulge themselves with Thai dishes. You can find all the different types of Thai cuisine here and of course, you will find dishes from other country’s cuisines as well. To some stalls, we were drawn by our noses, amazing and unknown smells spread through the street to tempt us into eating more. The cooks making dishes from scratch in front of us was just another unforgettable experience. I couldn’t stop staring while the chef cuts the veggies, soy and meats with scissors into the pan, stirs rapidly while the steam covers the sizzling mixture for a while, then it’s all done! At almost every corner or small streets (soi), you are to find a small kiosk or just a counter, grill, shelf attached to a motorbike. Culinary pleasure in just one bite or you can buy full portions like a dish instead of skewers or snacks. Another reason we love street food is the opportunity to meet locals and familiarize with Thai culture. We had a great time sitting down on the small plastic chairs to eat and exchanging a smile with others, even getting into conversations. Locals really appreciate if you are open to their favorites and we appreciated their hospitality very much. Grab a small chair and order a delicious meal. Try Tom Kha Kai (Chicken Coconut Soup) it’s mild and one of the tastiest soups in Thailand. A great variety of nice bites welcomed us on the streets. At almost every corner or small streets (soi), we found a small kiosk or just a counter, grill, shelf attached to a motorbike. We struggled with making choices. In the end, we just walked home with dozens of boxes of yummy Thai food. If you like Durian you should definitely try Khao Neow Toorien (Durian, Coconut Milk Soup & Sticky Rice) just follow the smell of Durian and you’ll find the stalls who sell this Thai dessert in no time! Most people either HATE or LOVE Durian. Honestly, we both hate even the smell of it but we have friends who couldn’t live without it. If you haven’t tasted it yet give it a try and figure it out which group do you belong to. 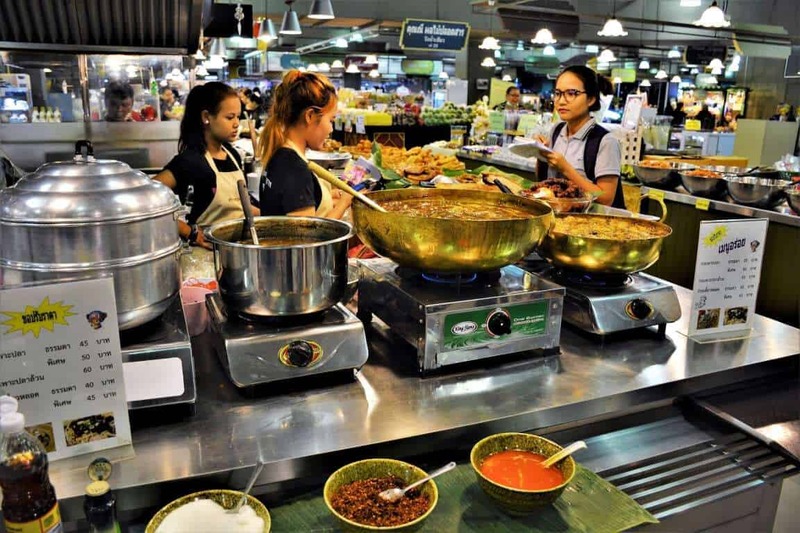 This Market is definitely one of our favorites and is one of the most unique places to try Thai Cuisine in Bangkok. Chang Chui quickly became my favorite hang out spot after my friend Sasiwan showed me around. 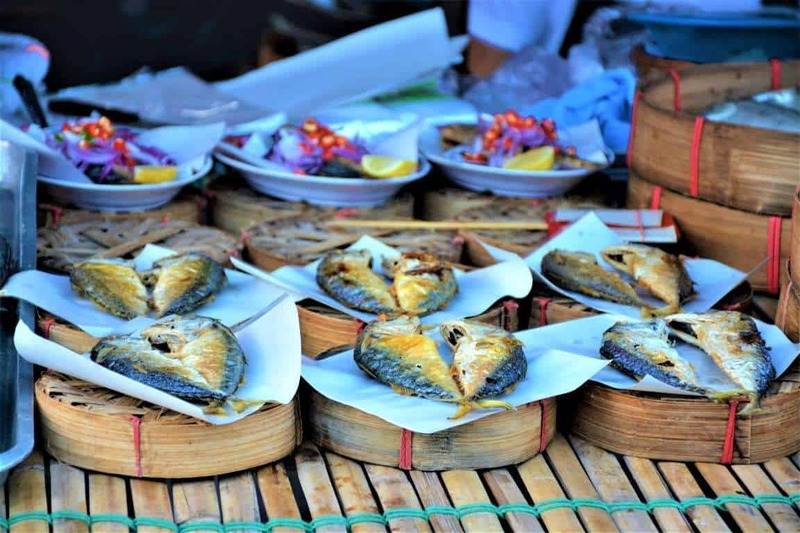 This market is basically an open-air museum filled with cool art, vintage clothing, unique restaurants, and – you guessed it – delicious Thai street food like Moo Ping ( Grilled Thai Curry Chicken Skewers). You can find here amazing restaurants too and if you’re brave enough you can even try some very tasty fried insects. There is also an art cinema and many galleries. Oh, and did I mention that a huge plane with a red slide is sitting in the middle of it all? 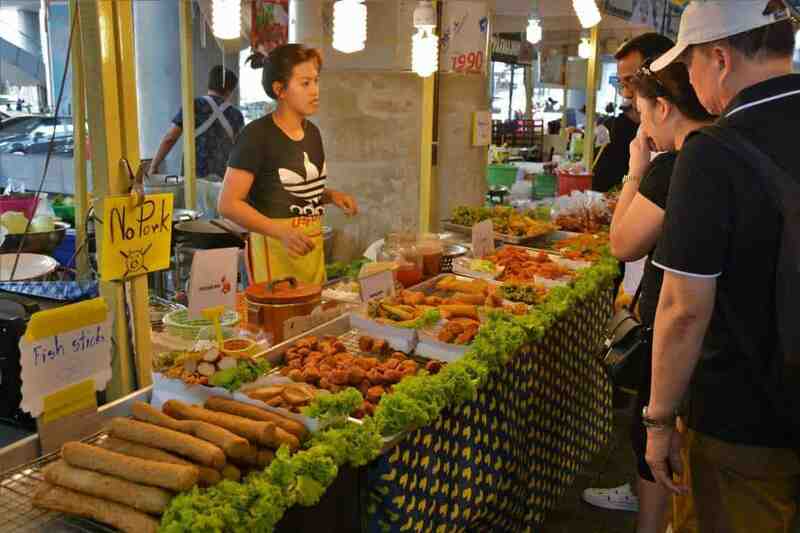 Bangkok’s most famous and fun night market has basically unlimited options for you. The bad news is that it’s almost always filled with tourists but the good news are that the quality of the dishes are still fantastic and the fun you will have here will become pleasant memories. You can do more here than just trying Thai dishes, there are many amazing vintage clothes stalls and shops, and unique bars are also filling up the place. You can also find live music and cold beer in almost every bar here. Grab a Khao Lam (Sticky Rice in Bamboo), pick the bar you fancy the most and enjoy your night! Floating markets are on every visitor’s list and they should be. They’re amazing, busy places where you can try fresh and traditional Thai dishes like Som Tum (Spicy Green Papaya Salad) and Khao Pad (Fried Rice). It’s a fantastic place to get a little insight of Bangkok’s past and the way Bangkokians used to live and traded. 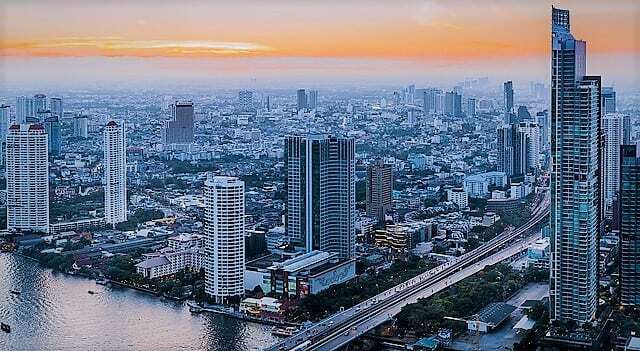 Bangkok was called ‘the Venice of the East’ for the longest of times. 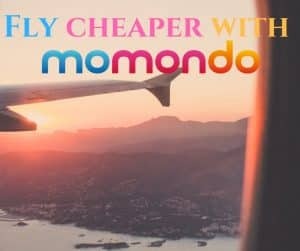 You can still hop on boats and float down canals and discover Bangkok on water but the best place to do this is definitely Damnoen, (biggest one) Amphawa, (second biggest one) and Khlong Lat Mayom Floating Markets (the most charming and authentic). 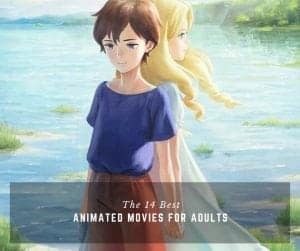 This is especially for you if you want to try something unique. Maeklong Railway Market can be found in the outskirts of Bangkok and it’s a one of kind experience for sure. This market became special because it has an active train running through the middle of it while you’re having your lunch or buying a souvenir less than a meter away from the moving train. You’ll hear the train’s fog horn before it arrives and can leave the rails. This market is visited by locals and tourists as well so you can find various things, including snacks, fruits, and veggies. But you can buy clothing, keychains, and flowers as well. For some snack try Poh Pia Tod (deep fried Spring rolls) you can choose from rice noodles, veggies or meat filling. For some sweet pleasures try Kluay Tod (deep fried mini-banans). 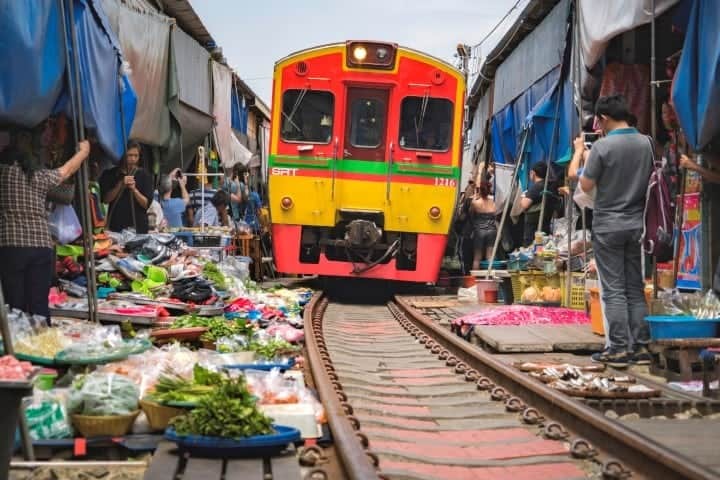 To make the most out of your visit check the Maeklong Railway Market train schedule before you visit to make sure you’re there when the train passes through the market. You can also check the info about how to get there. Jay Fai or Auntie Fai cooks her now world-famous noodles with eggs, prawns, and crab over charcoal fires. Here you can try one of not just Bangkok’s or Thailand’s but the world’s most famous street food; Kai Jeow (Thai omelet). Auntie Fai’s special browned, thick, Thai crab omelet. Her restaurant was awarded a Michelin Star in 2017 which officially made her the queen of Thai street food. Kai Jeow is usually the most common and one of the cheapest Thai food you can try in Bangkok here it costs a little more. $25 to be exact. However, if we consider that it’s a Michelin Star dish the price suddenly doesn’t seem that high. You can find Raan Jay Fai restaurant on Mahachai Road. 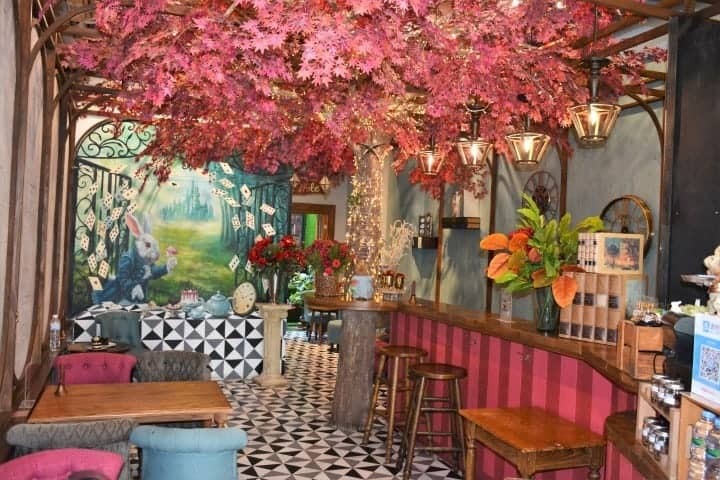 You can’t leave Bangkok without trying out at least one of its quirky cafes and restaurants. These cafes are the favorite hang out spots of most Bangkokians and tourists alike. 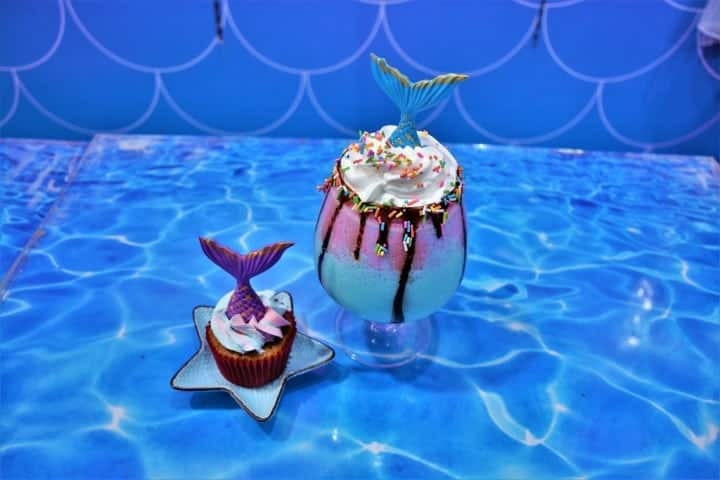 You can visit the Mermaid themed Cafe house Mermaid Castle Cafe, the Instagram famous Unicorn Cafe, the Alice in Wonderland themed Perhaps Rabbits’ or Caturday Cafe. You can find here traditional Thai dishes with an extra, creative twist. 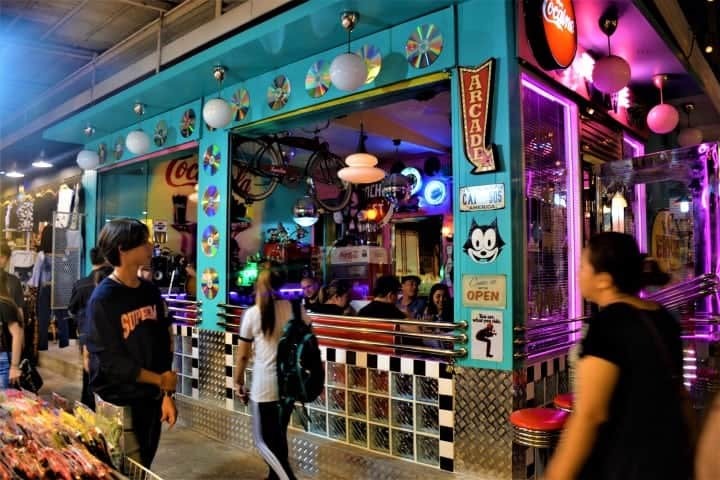 These Cafe houses are the perfect place to have some fun and to see where do the younger Bangkokians like to spend time. 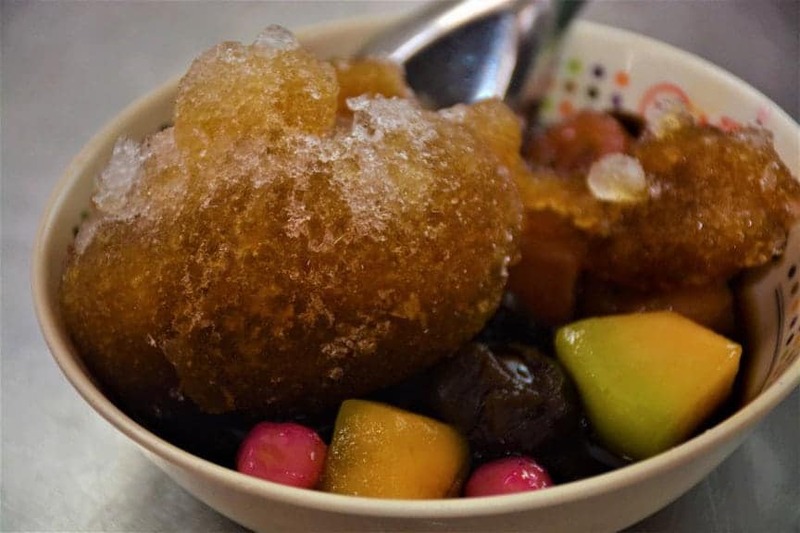 One of the most popular Thai desserts is Khao Niao Mamuang (Thai Sweet Sticky Rice With Mango) you can try it in most cafe houses, restaurants or on the streets of Bangkok. It can be served hot or cold, I prefer the cold one especially because of the always hot weather we have in Bangkok. 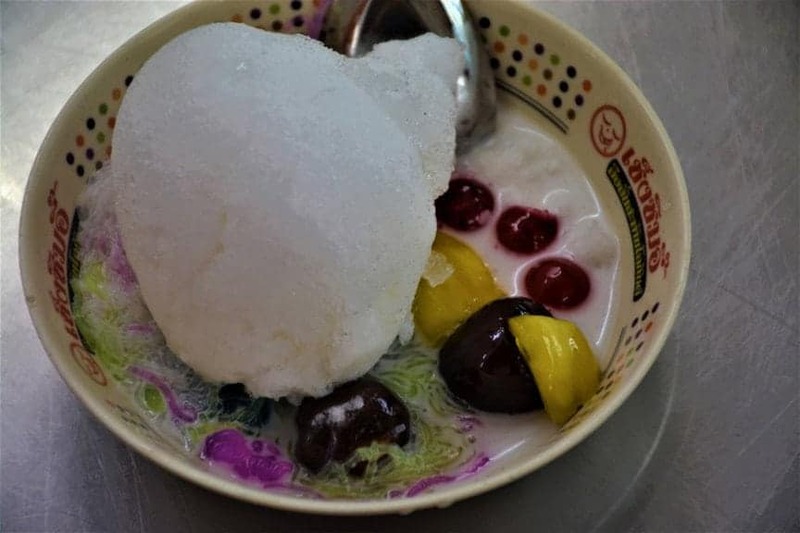 Nam Kang Sai which is basically mixed ice desserts and it can be found on Thanon Chan road, in South Bangkok (nearest BTS Silom line stop: Surasak). Favorite of the locals, a dessert stand, which offers so many different colors, sweetened fruits, and gummies. Our friend Ray showed us this great shop. People with sweet tooth stop looking for fulfillment! 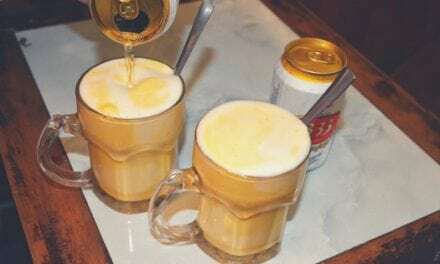 Have it hot or cold. 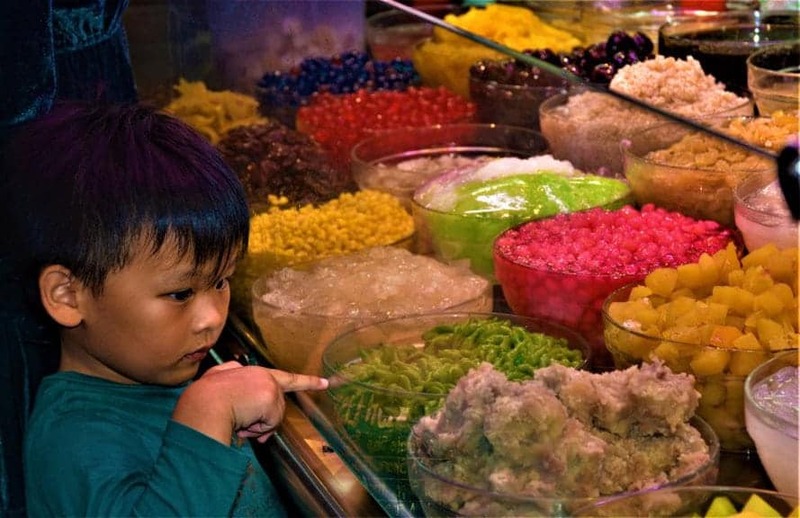 You will probably see a couple of similar sweet shops around Thailand. However, you should know this was the first and original. It’s just a plus that this is also the best one. 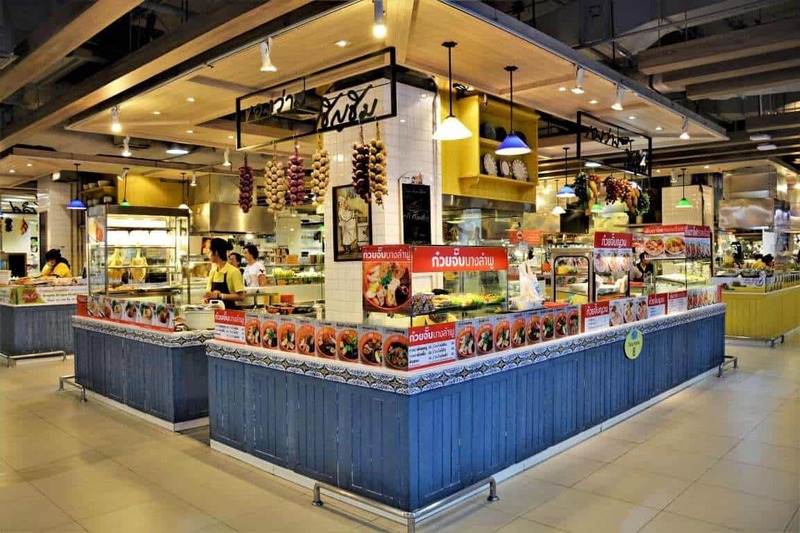 When we first walked into a shopping mall, we were surprised to see Mall Food is at some places similar to street food but in a completely different environment. If not brave enough to try food from street vendors, there are shopping malls, in which you get nearly the same food for a bit higher cost. A meal for one: 40-120 Baht ($1.1-3.5) on average. On our weaker days, when preferred to walk in an air conditioned “street” we just hopped into one of the many malls and had a delicious meal. Most of the malls feature the good old fast food chains and local food as well. Going down to the food court\patio, you get food for a relatively low price and still get to try freshly made local dishes. You can buy traditional freshly made Pad Thai Noodles, any of the Thai Curry dishes, such as Gaeng Daen (Red Curry). Do you have a sweet tooth? 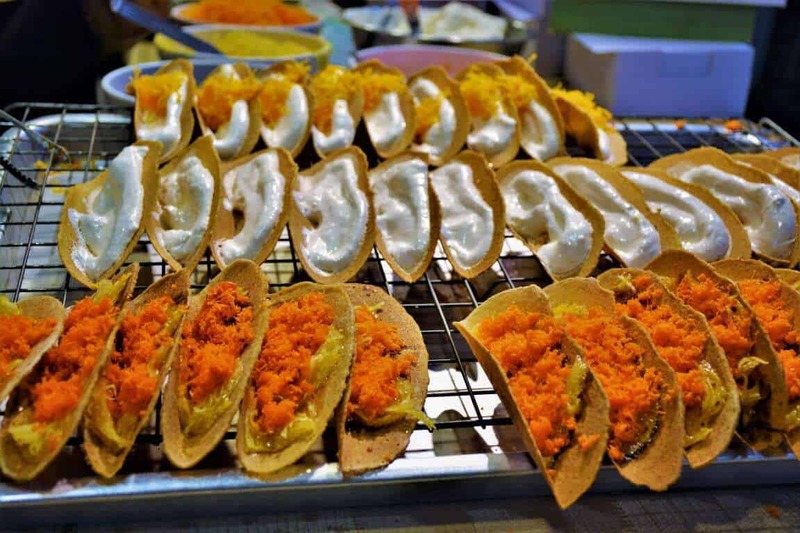 Don’t worry because here you will find many delicious types of desserts you can choose from like Khanom Buang (Crunchy bent Thai Crepe) or the tasty Roti Gluay (Banana Pancake) both can be found in malls, markets, and on the street. The list is really endless, you can find many and any dish of Thai cuisine at these places. Our favorite Mall is hands down the Paradise Park in Bangna. When we first came across Hot Pot we liked it so much that did not want to leave the restaurant. After traveling for a while, we missed cooking and here this hole has been filled. We like the running sushi concept, but love the running hot pot! Couldn’t stop taking the veggies and seafood off the conveyor belt and drop into our boiling soup. We were shown how to dip the ready pieces in the spicy sauce after bumbling for a few minutes. Our conclusion: everyone must try it! This concept is often offered in all you can eat packages. At most of the restaurants offering hot pot, there is a sushi buffet as well. With soft drinks included, it is a good choice to try a little bit of everything. Price per person: 250-400 Baht ($7-11). Our favorite place is near Ekkamai station on the top floor of Major Cineplex, called Oishi Buffet. Although the area is touristy you’ll only see locals at this place. 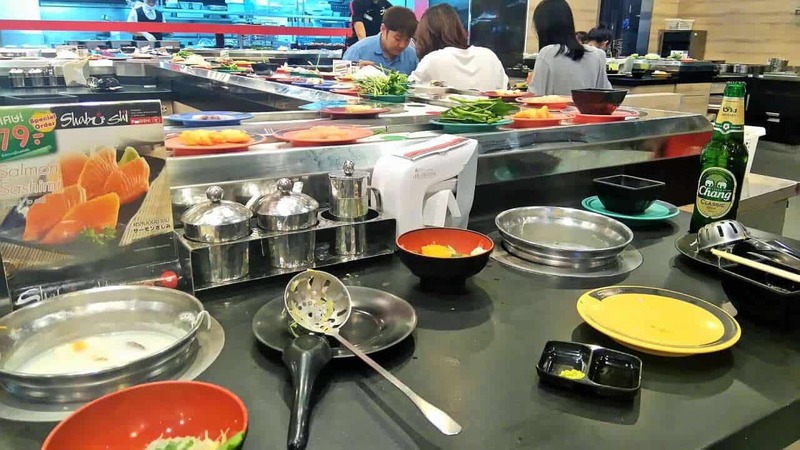 Most of the Thai restaurants have Hot Pot options you in most cases can tell just by looking at the table and check if you see the built-in hot plate in the middle of the table. 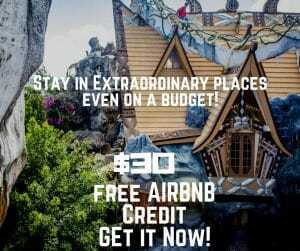 One of my favorite Hot Pot experiences were in Khao Yai while I was visiting the magical Hobbiton resort when I got invited to dine with the staff. It was the tastiest dish I’ve tried. So give the hot pot a try! Being about 20 km (12 m) south of central Bangkok, it is not the restaurant you are going to accidentally run into. It is definitely worth a visit for the quaint ambiance, the lovely food, and drinks. 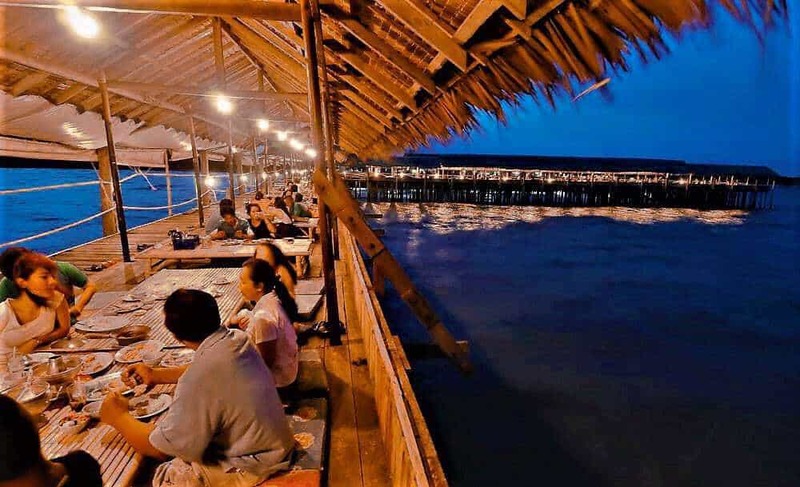 The restaurant is right at the seaside so you can enjoy a perfect sunset while having fresh and yummy seafood. This restaurant is almost intaierly visited by locals so the staff’s English is not the best but they’re very helpful and kind. So you will have no problem with ordering. While the first time we went here with our Thai friend (who obviously did the ordering) the second time around we went alone and we had no issues. 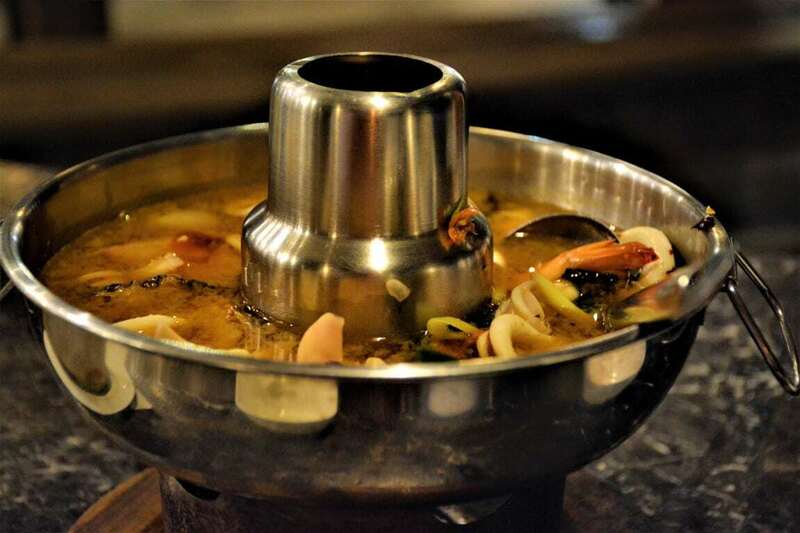 This is a perfect place to Try traditional Tom Yum Soup‘s (On the image below) any variations (with veggies, chicken, seafood). Tom Yum is one of the most famous dishes and most people mention it when talking about Thai Cuisine. It’s one of our favorites as well and this restaurant makes a really good one! 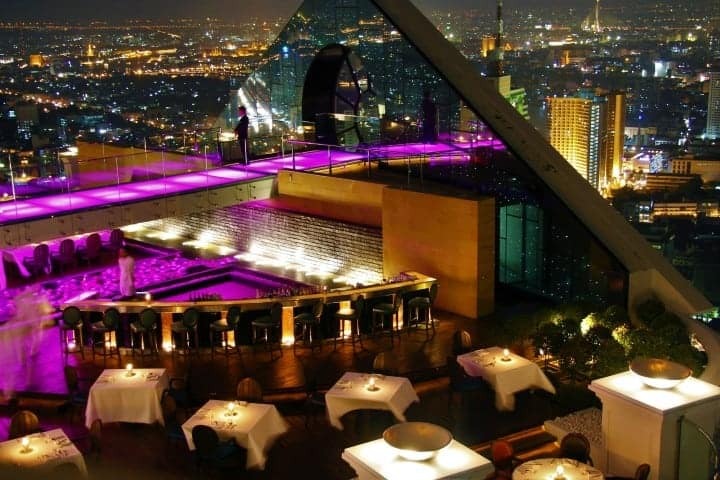 In case your budget can bare a much more expensive dinner do not miss a fancy dinner at one of the Sky bars in Bangkok. You should know, with drinks you will easily spend $50 or more. Although, we think it’s money well spent. Imagine a fine meal accompanied with a breathtaking view of the city’s skyline. One of the best views offered by the Lebua State Tower. Definitely one of the best places in Bangkok to enjoy the delicious treasures of the Thai Cuisine. The View from the Lebua State Tower bar. Don’t miss out on the tastiest tea experience of your life! I think one of the first things I tell to friends and family members who ask me about Thai cuisine is this magical drink. The original drink is made with milk and condensed milk so if you’re on a lactose-free and/or sugar-free diet you should try your luck in bigger Cafe shops because the small ones only make the original. 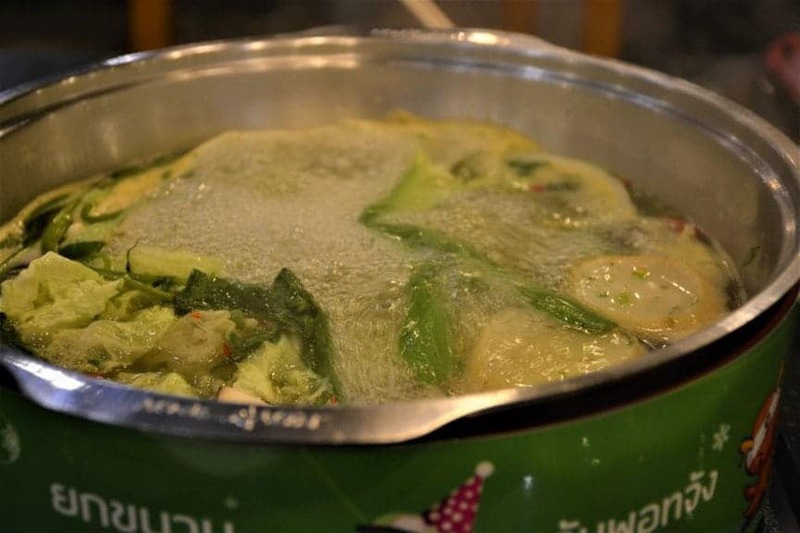 It goes perfectly with the spicy Thai dishes and cools you down on the hot days. It may not sound special when you hear about this tea but believe me after you try it you’re opinion will change quickly. The other special drink I got to try in Asia was the Egg in Beer in Hanoi which inspired my best Butterbeer recipe for adults ever. 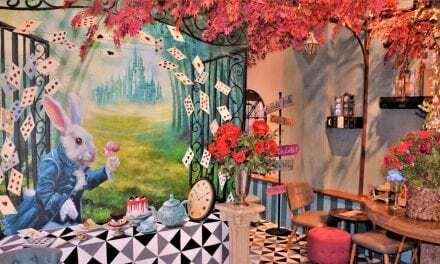 One of the tastiest Thai Tea’s I had was in Perhaps Rabbits’ which is a charming ‘Alice in Wonderland’ themed dessert shop. You can try many of the traditional Thai desserts like black bean cake but with a stylish and creative look. This is also a perfect spot for relaxing and reading. 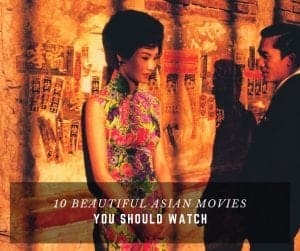 You can pick up one of our recommendations. 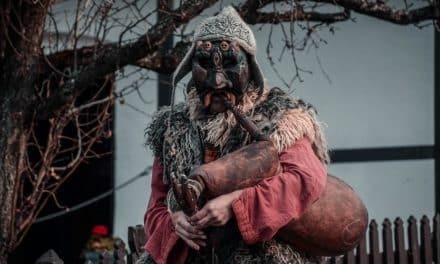 Check out our lists: best fantasy books that will give you serious wanderlust, best poetry books to read when you’re feeling down or funny books for weirdos. 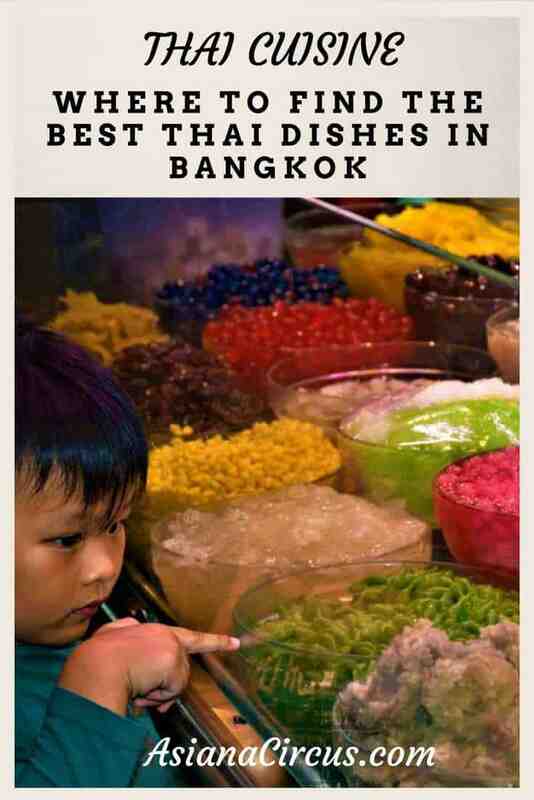 Where is your favorite place to eat in Bangkok? Hey, great post! I’ve always wanted to visit Bangkok someday. 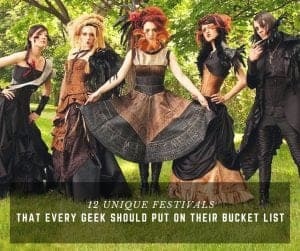 For some reason though, none of the pictures were showing for me in your posts except for the first one (probably because it’s a featured image). You might want to take a look at that, though I can’t be sure if it’s just me. That doesn’t usually happen though. Thanks so much! 🙂 Maybe because there is a lot of photos and would’ve taken a long time to load. Not sure. But I will check. I haven’t had this problem before… I’ll check. Hmm…it looks like it’s only a problem on WordPress reader and not on your actual website. *Shrugs* A pleasure to visit your site anyways! Thanks again for the heads up & for the visit! It’s one of my fav places for sure. 🙂 I hope you will have fun!